I was listening to Gary Vee's podcast and he was talking about the founder, Simon Cheng of Pique Tea. Gary Vee was talking about morning and night routines, or just routines to be your most productive self. And he said he loved what Simon has to say about tea, and that when you're drinking the tea, take time to think and reflect and to just enjoy the present moment. It is so true, usually we rush and are out the door to a coffee shop and getting mediocre tea, or coffee to chug for energy. What if we train ourselves to enjoy our cup of caffeine in routine, rather than rush? It's basically like setting an intention for the day with your cup of what you prefer. Starting tomorrow, with my new tea.. I am going to sit with a pretty mug and actually put my sacred corner to use.... You read it here first, and you can hold me accountable on my IG story. blend this first for your base, with cinnamon and a date. Sit with Crystals and change your negatives to positive. ps. how cute are these packets, ready to go wherever you are! When Billy Madison said this in class, I guess he didn’t realize how much 15-30 drops of chlorophyl could help his hangover. What he also didn’t know is how he could learn to give his teacher… a lesson in glowing skin, as well as detoxifying her body. It’s a green pigment present in plants which facilitates the absorption of light from the sun. Which then converts the light energy in a usable form which is utilized for various processes such as photosynthesis..... of which the green plants prepare their own food. And we as people use chlorophyll as a form of natural medicine. But difficult to attain enough of it just through just by consuming food itself. 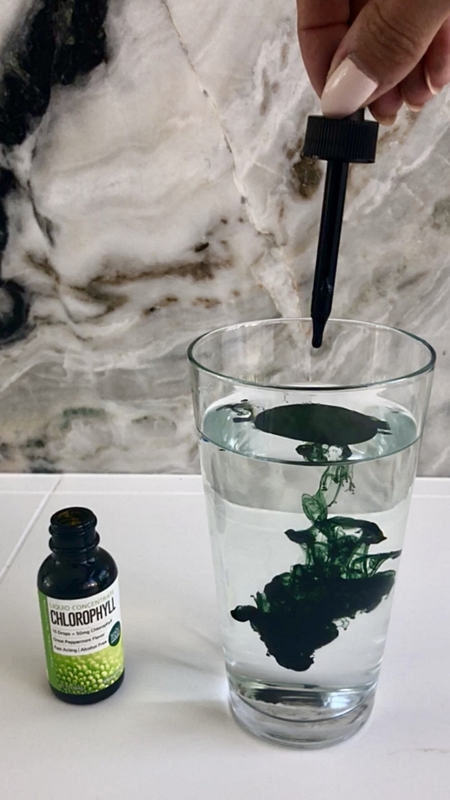 Since its green pigment comes from plants and absorption of light, these concentrated green drops are an easy way to get a whole bunch of greens and hydration with mixing it with water. Not to mention the internal deodorizer, and detoxifier as a benefit. It’s like the best green juice, without the fuss of making a mess or buying the expensive 8+$ juice in a store. I did 20 or more drops in my water first thing before coffee for over 6 months and my skin was GLOWING. And I was not drinking juices to help promote healthy skin either. I was on the beach everyday for 3 months, sweaty hot yoga classes and was able to maintain healthy skin. As well as helping to aid my digestion. I ran out after 6 months, and decided to do a little test with myself. I stopped chlorophyll for almost 2 months, and let me tell you.... my skin FREAKED out. My breakouts were insane. Especially hormonal ones. I felt more tired as the day went on, and my bones were more achy than usual in the harsh cold weather. Discolored feces, but don’t be alarmed! Just your insides cleaning out! Yup, so chlorophyll…. Not so borophyll after all!